A Little Bit of Quiet: Pimp My Cubby House! 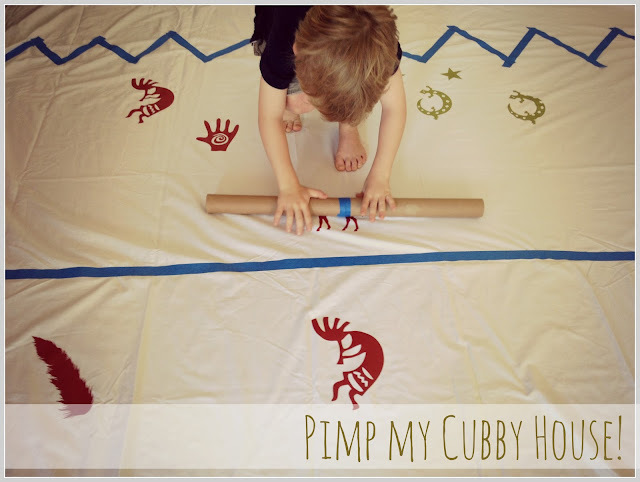 Do your kids L-O-V-E making cubby houses or blanket fortes? Mine do, and are absolutely crazy for them. A weekend does not go by without "Mum, can we make a cubby? ", which is why I have a stash of old sheets in the linen cupboard just for this purpose. Anyway, this weekend, when we got a break in the weather (it's been raining pretty solid here for a couple of months now), my son & I decided to "pimp" one of the sheets and make it much more "cubby-like". We thought an Indian-inspired theme would be fun, and would make the whole cubby experience feel a bit more like being in a teepee, so we set about finding some shapes to stick directly onto the sheet with the intention of then spray painting over the entire sheet leaving us with a coloured sheet and white shapes. I have a Silhouette Cameo machine so I searched "Indian" using the Silhouette software and purchased a random set of shapes that my son liked (which, FYI, cost 99c per shape). If you don't have a Silhouette then you could just download shapes straight from the internet (actually my very first thought was to go out and collect things from the bush or beach - leaves, shells, twigs etc - and use them but, to be honest, I just couldn't be bothered doing that!). The good thing about the Silhouette is it cuts adhesive vinyl so our shapes could be stuck directly onto our sheet. We placed shapes randomly over the sheet, in no order whatsoever, and also added in some lines and zig-zags with painters tape. I then mixed up two bottles of watered-down fabric paint, gave them an extra good shake, and we got to spraying. We gave the sheet a really good spray, with lots of coats, and then once it was dry we peeled everything off to reveal our characters underneath - always the most exciting bit. This is so cool! My nephew would LOVE it. He loves a good fort. That looks fantastic! I have to keep this craft idea in mind for when Alexander is bigger. Very cool and looks really easy to do! The kids would love this activity.